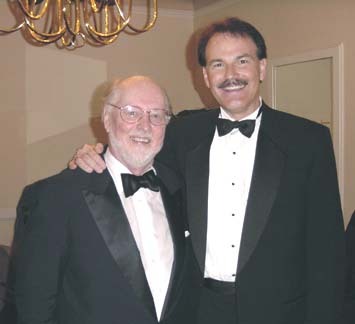 FIRST OF ALL, let me say that working with Steven Spielberg and John Williams was an extreme pleasure in every way. I was very honored to be asked to perform on this, their 20th movie collaboration. I've always been a fan of John's scores and have worked on several in the past. This film, however, was a bit different in that the featured solo voice was the alto saxophone. As is common in the recording film industry, the musicians are not privy to the music before the actual sessions. This was also true in this case. However, I was able to see the longer "Father's Theme" (track 4 on the soundtrack CD) a few days before recording. I was appreciative of this, as that piece required some work involving long phrases as well as two short cadenzas. Throughout the score the saxophone lines were quite chromatic and many times doubled with vibraphone by one of LA's finest percussionists, Alan Estes. It was a pleasure having Alan's great time and concept during the faster passages we shared. Generally we made four to six takes of each cue and that would be considered about average for a major motion picture. This is why it is important to play well on each take as it could be the take that's used in the movie. Many times John does not use a click track while recording, making it important to play with good time while letting the music "breathe" when appropriate. The main advantage for me when recording without a click track is not having to wear headphones, allowing both ears to be open to listen to the entire orchestra. I feel this allows for an improved sense of pitch as well as adding to the overall musicality of the orchestra. We recorded the soundtrack in September at the wonderful MGM Sony soundstage and it took about five or six days to complete. The movie was released three months later on Christmas day. I played my usual alto set-up which is a Meyer mouthpiece with Vandoren reeds. Even though much of the score required a somewhat classical sound with control, I felt it was important to play a familiar set-up that could perform in both the legitimate and jazz modes. The choice of reeds played a big part in shaping the tone to fit the different styles required in this score. I preferred the darker tone of the Vandoren Java reeds which served me in their usual dependable manner. Having played on over 300 scores, I found this music stylistically perfect for the film, and with John's touch and knowledge of saxophone writing, it proved to be a highlight of my career. John has re-orchestrated three movements to be part of his published scores which allows this great music to be available for future live performances. With the saxophone world always looking for new music to perform, I know this "Catch Me" Concerto will find its way into the literature and be embraced by all saxophonists. Soundtrack: "Catch Me If You Can" DreamWorks records #0044-50410-2. To find other articles written by Dan for this web site, please visit his Archives.